GlobalShop 2018 has just kicked off and we couldn’t be more excited. Located at McCormick Place in Chicago, the show is full of exhibitors and attendees ready for an exciting experience. And to make a great show even greater–GlobalShop awarded our booth! We received the news yesterday morning that our RoboShop booth won a Best Booth Design Award! Combining the theme of GlobalShop’s #notmyapocalypse with our customizable services, we created a RoboShop where you can build and adapt your own services to make your business shine. Here’s some more information about the award, the show, and the RoboShop booth we’re featuring this year. We were honored to have won this award at GlobalShop 2018. Most of all, we look forward to spending the rest of the show talking about all of the exciting things that Gilson has to offer. We’re showcasing Mindwire demos and talking with attendees and exhibitors alike about the future of retail and how our services can build a better experience. GlobalShop has been the nation’s largest retail design industry trade show for more than twenty-five years. As a result, it’s become the premier place for networking and fresh ideas and solutions in the industry. Because of that, Gilson is happy to be a part of the event. And we’re excited that so many people are responding to our theme and booth design at this year’s show. This year’s booth was our very own Gilson RoboShop. Celebrating Gilson’s diverse services, we created robot versions of the services we offer. These Gil-Bots showcase how clients can customize their experience by using any or all of our services and packages. 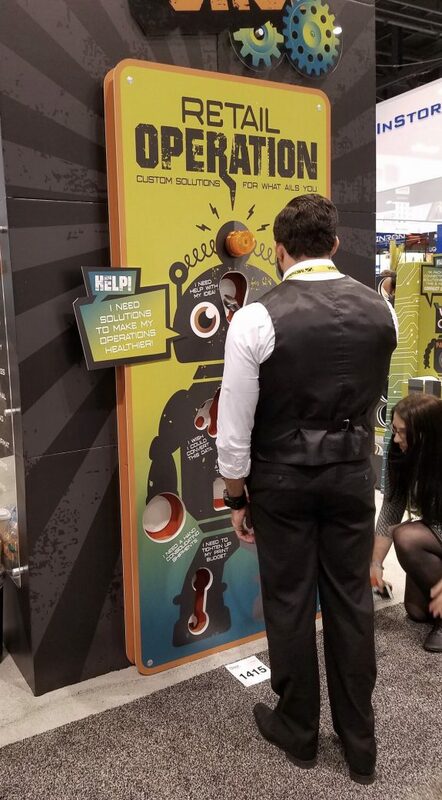 We’ve got life-size games of Retail Operation, Connect Four, and Build Your Own Bot stations. Last year we had our Retail World booth, which was a big hit and had a retro gaming theme. Since people enjoyed our interactivity so much, this year we wanted to keep that fun tradition alive with our new RoboShop look. And we’re glad that trying to top ourselves paid off and that people are having so much fun with our RoboShop theme. Gilson Graphics loves to attend GlobalShop always has a blast creating unique booths and themes to share our experience and services. Visit us at Booth 1415 to try all of our activities and learn more about how Gilson can help you customize your strategy! Congrats to everyone involved in creating our booth and here’s to a great show!